It is thrilling to watch and hear Trumpeter Swans taking off! Their large feet plopping faster and faster as they gain speed is unmistakable and very dramatic. Watch this video of a group of swans taking off at sunset. Trumpeter Swans may be the last birds in a mixed flock of Tundra Swans to take off. They may stay up to one or more minutes longer than the Tundra Swans. This happens when Trumpeter and Tundra Swans occur together but are not entirely intermingled (Trumpeters remain at one end of the flock as a group). This is a subtle characteristic for separating Trumpeters from Tundras and must be used in conjunction with other identification methods. Trumpeter Swans frequently bob their head and necks up and down (head bobbing). With this motion they also have a variety of vocalizations. This combined activity apparently serves as a form of communication between individuals and within the group. Head bobbing and vocalization activity increase when the birds are disturbed and reaches maximum intensity just prior to the birds taking flight. This behavior may be brief or absent if the birds are suddenly startled and take flight. Check out the video "Swan Behavior" posted on our Facebook Page on October 13, 2018 to see pre-flight head bobbing. You can view it without a facebook account. Tundra Swans do not bob their head and neck up and down like Trumpeter Swans. Occasionally Tundras will nod only their head up and down. There is no defined preflight display as in the Trumpeter. While vocalizing Tundra Swans may hold their head and neck out at a 45 degree angle.The behavior in the photo is the “neck-stretching” display, in which Tundra Swans thrust their heads and necks forward, either to reinforce bonds with their mates or threaten other swans. You can tell the difference between the two swan species at a distance. Trumpeter Swans can be identified at a distance as they thrust their heads vertically up and down in display. Tundra Swans will not. Photograph by Carrol Henderson. These two Tundra Swans show a 45 degree angle in their head and neck position. A Trumpeter Swan will pull its neck into a shallow "S" curve just a split second before beginning its takeoff run. If you look carefully at the banner photo, you will see the neck positions in the take-off sequence. From left to right: the swan's head sinks into its chest and its neck forms a "C" [this is an unmistakable position for a takeoff]; the wings begin to rise at the swan's side and its neck remains compressed as the swan gathers its energy for takeoff; the swan's neck forms the "S" curve and its wings begin to lift; like a straight arrow, the swan shoots forward and begins its running takeoff. IMPORTANT: Some Trumpeter Swans are marked with identifying neck bands. Please note the collar color and number or letters as well as date and location. 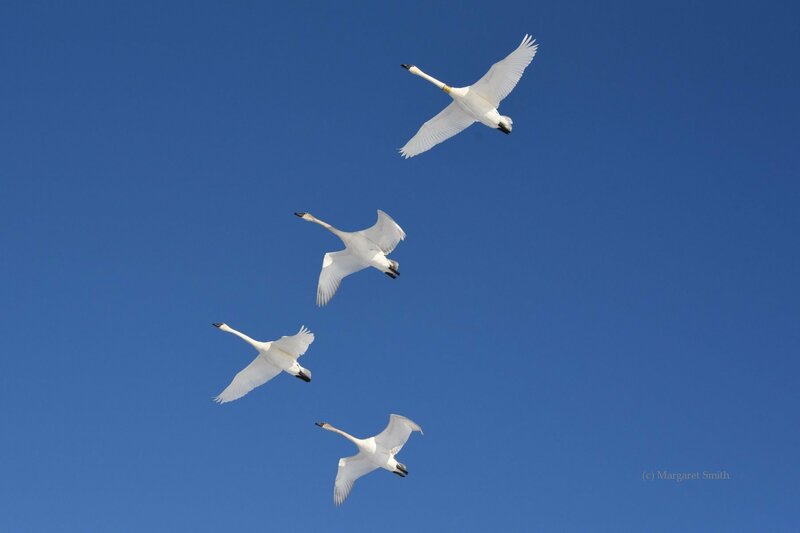 Go to our Trumpeter Watch Report page to see how you can be part of tracking that particular swan's movement. Trumpeter Swans are large birds and need a lot of room for takeoff. They become airborne while close to the ground and it takes several seconds before they reach greater heights. 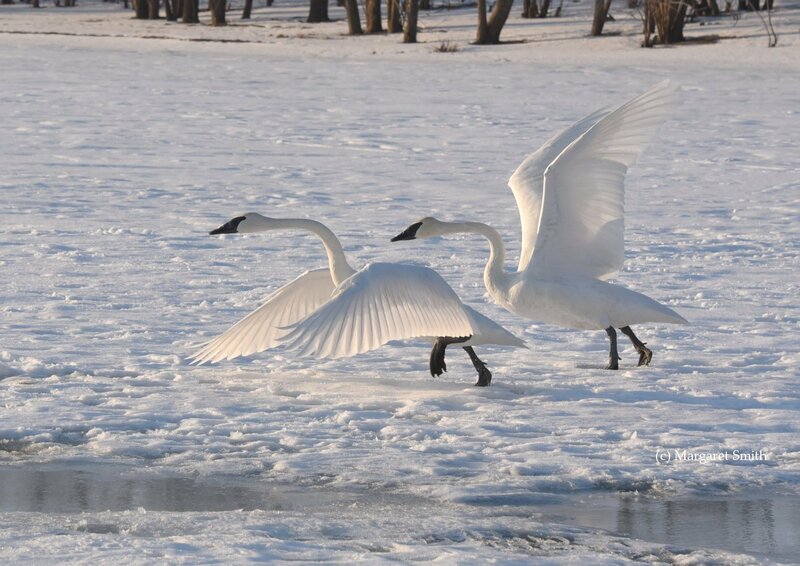 These two Trumpeter Swans show the typical "S" shape curved neck a split second before beginning a running takeoff. This is a swan family in flight. At the top right is an adult swan with a yellow collar, 00C. This is a Wisconsin female swan. 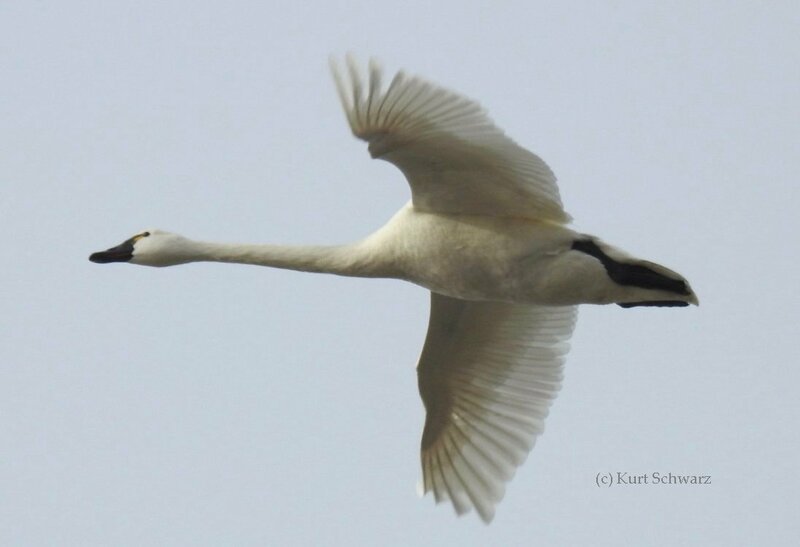 (This is a collared/marked swan that would be reported to the Bird Banding Lab- go to our Trumpeter Watch Report section). Her mate is the white swan second from the bottom. Their two grey feathered cygnets are the very bottom swan and the swan between the two adults. Trumpeter Swans travel in family groups. This Trumpeter Swan group is close to landing. Notice the legs and feet have come down in preparation for the landing. Someone described it as looking like 747 airplanes coming in for a landing. 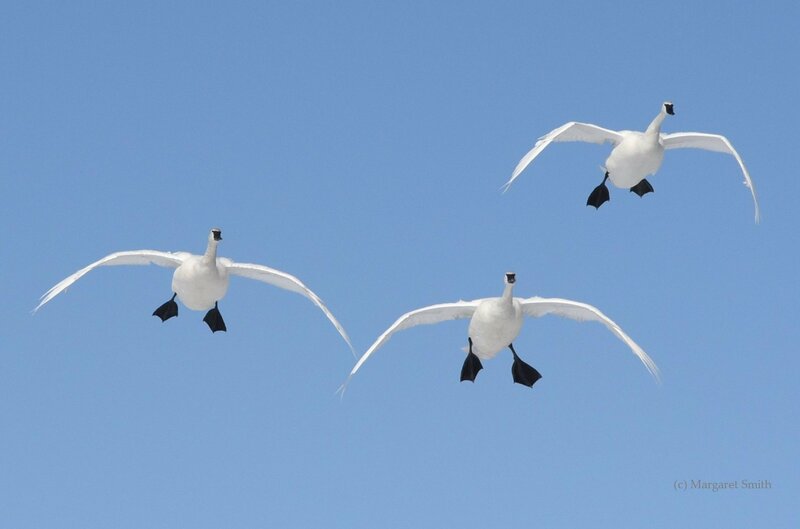 Tundra Swans hold their necks straight the entire time of the takeoff run and initial flight. This characteristic applies to both land and water takeoffs.